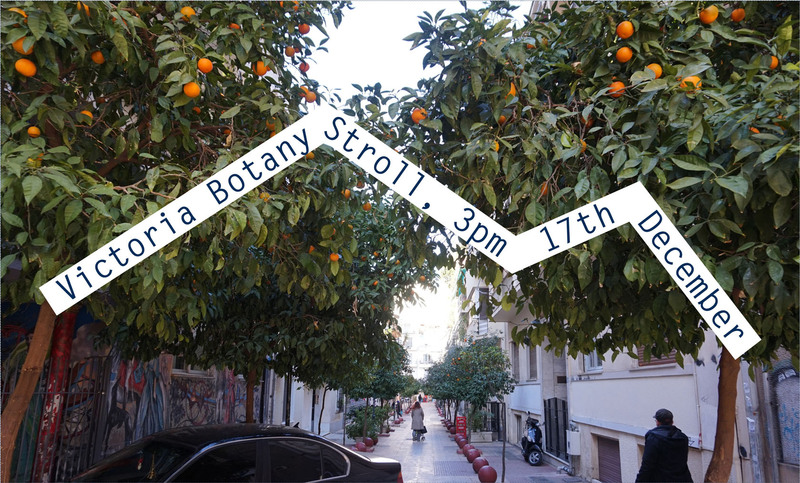 Victoria Botany Stroll with me and botanist Manos Bazanis, Athens, December 2017. Which tree has that smell? What is the name of that plant everyone has on their balcony? What is that tree with the strange looking seed pods? Do any of the trees or plants in the city have medicinal qualities, or should we just be happy that they clean up the air we breathe? Are the trees and plants that grow here native to Greece? What would happen to all the vegetation if the council stopped caring for it? Do trees in the city look after each other in the same way that trees in a forest do? We were also joined by Catriona Gallagher, part of the team behind the Athina Garden City project. The walk started and ended at Victoria Square Project Space on a sunny and crisp Sunday afternoon. After the walk I shared some experimental cookery and balms made with the addition of some Athenian fruit, flowers and herbs back at Victoria Square Project. We then picked Manos brains with a million questions. A map documenting the walk and everything we talked about is coming soon (I promise).